Event marketing to engage donors and encourage them to support a non-profit cause. Concert for a Cure is the principal fundraiser for Northern California Cure SMA, an organization that funds research to find a cure for a rare disease that affects children. The goal of the event marketing is to entice donors to attend, and to help create a fun and exciting atmosphere at the event itself to engage attendees and encourage them to support the cause. Scott Design has worked on this event for many years, and this year’s event was especially fun to design. 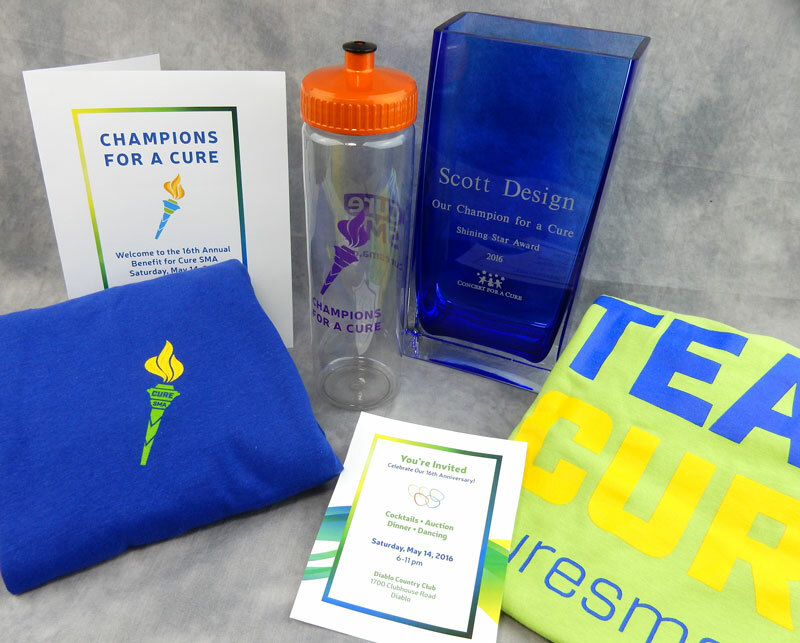 The theme was based on the idea of an international competition and called “Champions for a Cure.” Scott Design worked with the Concert for a Cure leadership to develop a color palette and imagery to support the theme, and then created artwork that could be used throughout the event materials, decorations, and promotional materials. One of the key marketing strategies this year was creating and sending emails to invitees using Scott Design’s proprietary email app, Special Delivery. The team was able to craft and send professional emails with the drag-and-drop email editor and send them out in a matter of hours as new auction items were added.